As a mom, I created this website to share why Parent Empowerment and Educational Freedom matters to me. I also want to show how it is possible for independent and empowered parents to successfully take on special interests. The articles and videos shared on my website are a glimpse into the issues and victories that I and other parents have experienced over the years. I hope my experiences inspire other parents to stand up and be active in their child’s education, just as I have been inspired by parents throughout the country. We are our children’s first teachers. I strongly believe that parents must have the right to choose the school that best fits the educational needs of their child — whether it is a district, charter, magnet, specialized, community, vocational, private, parochial, yeshiva, madressa or home school. When I first began on this journey as a public school parent, I realized that parents – the real stakeholders – do not have a seat at the education policy table. Even worse, some politicians, school officials, principals, teachers and their unions, seem to think that parents, especially Black and Latino parents, do not know what is in the best interests of our children. I have taken an unapologetic stand to fight for the educational rights of students and parents. From rallies, to press conferences to lawsuits, I do not back down when it comes to putting the educational interests of our children first. Since parents do not have a seat at the education policy table, I decided to bring my own chair along with other parents who brought their chairs too! 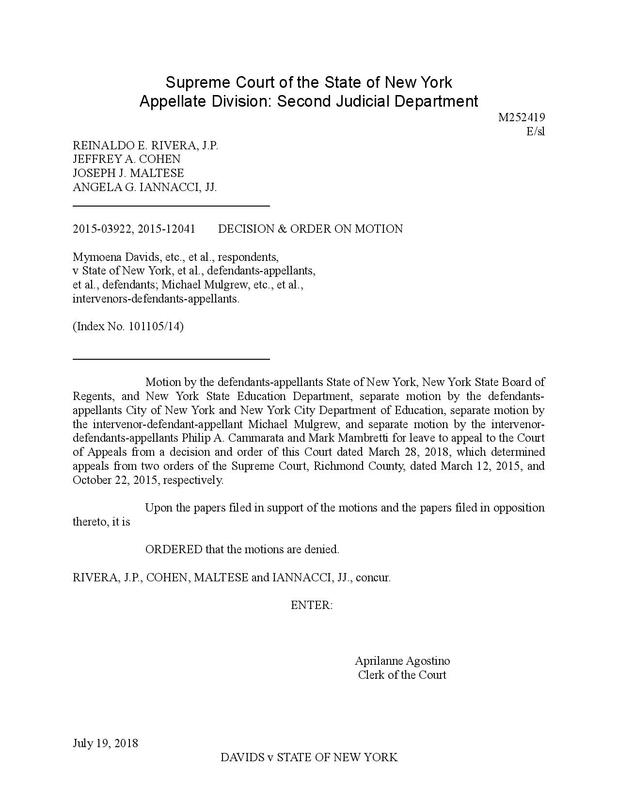 Yesterday’s court decision is another victory in the ongoing work to provide a high quality, safe and free education for all of our children. Our lawsuit is not about breaking the union; it is about removing those incompetent, racist and abusive teachers who are hurting our children.